In which the veteran Swedish metal innovators show the youngsters a thing or two about what makes a good metal album. Dark Tranquillity were one of the progenitors of the mid-'90s form of Scandinavian metal known as "The Gothenburg Sound", so-named after the Swedish city in which several bands were based. Dark Tranquillity know what they do best, and they stick to it. Peers like In Flames and Soilwork continue to challenge their fans with new sounds on every new album. The Haunted, an offshoot of the legendary -- and defunct -- band At the Gates, have simplified their sound to the point where they sound like simple American metalcore. But the six members of Dark Tranquillity continue to churn out quality albums, rarely wavering far from the formula. And while it's great to see bands like In Flames evolve as they have, it's also nice to know there's a group that can be counted on to deliver a good, solid album of the same old stuff their fans have loved for over a decade. To their credit, Dark Tranquillity have managed to put out their best record in years with Character, while continuing to dance with what brung 'em. It's quintessential Scandinavian heavy metal. The enormity of the sound is beautifully offset by subtle melodies, be they in the dexterous guitar work of Niklas Sundin and Martin Henriksson, or the ornate synth tones of Martin Brandstrom. Drummer Anders Jivarp holds everything in place. His ability to shift from high-velocity black metal rhythms to more subdued, introspective moments anchors the entire album. All the while, vocalist Mikael Stanne delivers thought-provoking lyrics in a distinctive, unwavering growl. Comparable to Lamb of God singer Randy Blythe, Stanne spouts the verses in a hoarse yet clear manner, his ability to enunciate clearly compensating for his lack of vocal range. The songs are all strong, some exceptionally so. "The Endless Feed" is an instant winner, with Brandstrom's keyboards and electronics providing a very effective backdrop to the gothic-tinged tune. In the song, Stanne contemplates the influence the media has on the public's taste, musing that "Your own favorite entertainer is none other than the one we call you". The first single, "Lost to Apathy", is the most outwardly melodic track on the album, with its great synth hook and dizzying guitar harmonies. Jivarp alternates between a pummeling thrash delivery and a chugging, 6/8 beat. "Mind Matters", relatively simple compared to the rest of the album, bears a strong similarity to the refined power metal of Arch Enemy, while the adrenaline-laced ferocity of "One Thought" is counterbalanced by more of those Brandstrom synths. It's Brandstrom who emerges as the most valuable musician on this album; his electronic effects are actually toned down in comparison to the band's recent releases. Although Character marks a return to the tighter arrangements of their the band's work, Brandstrom still plays an integral part. His musicianship might not be as ostentatious and over the top as Nightwish's Tuomas Holopainen or Sonata Arctica's Tony Kakko, but he always finds the perfect way to enhance each track, whether he's nimbly duplicating a blinding lick by Sundin or Henriksson, or creating an ambient mood to enhance the raging cacophony. Without Brandstron, Dark Tranquillity would be far less interesting. Character comes to a stirring conclusion with the surprisingly gorgeous "My Negation"; in fact, if someone like Nightwish's Tarja Turonen or Lacuna Coil's Cristina Scabbia handled lead vocals instead of Stanne's wracked screams, the song would border on pop metal. As it is, the song is a perfect encapsulation of Dark Tranquillity's flawless balance between melody and aggression. 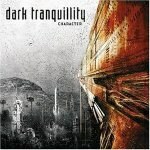 No, it's not breaking any new ground, but that doesn't mean Dark Tranquillity are willing to play it safe. Fans will eat this one up.